Philippe Labro 's sophomore effort "Sans Mobile Apparent" based on an Ed McBain novel,was an unpretentious but effective little thriller. "L'Heritier " is another thriller ,but this time blown up out of proportions ;it seems that Labro had "citizen Kane " in mind ;he lived and studied in America and his infatuation with this country had kept growing.The style is jerky ,with flashbacks (two of them's purpose (algeria war and a rugby game)is to make us believe -which is,after Jean Dessailly's depiction ,redundant- that Bart Cordell is a tough guy . It's a sprawling work ;overblown, full of implausibilities (do you really believe that Cordell spent ten years in the USA? ),the story drags on ;Labro does not possess Henri Verneuil's know-how ("Le Clan Des Siciliens" almost sounds American,and that director does not go out of his way to,as Labro desperately does ) .The screenplay is a hodgepodge which involves the media power,the industry,social concerns,an unpleasant macho side ,WW2 concentration camps,the Vatican, the fascists ,a dangerous call girl,a terrible family secret ,sabotage and a roses greenhouse. 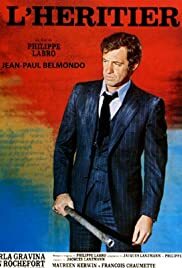 The movie features generally unsympathetic characters and it takes all the talent of seasoned actors to liven things up a little.Belmondo seems bigger than the screen:the sheer glorious immodesty of his character is a bit off-putting (the scene on the train with Carla Gravina ,and the slaps between her and her boss are downright embarrassing). NB:the subject was reprized by writers Francq and Van Hamme in their absorbing comic strip "L'Heritier";Largo Winch has nothing to do with Cordell ,but his story is extremely well constructed ,masterfully blending present and past .